Rajasthan High Court Recruitment 2018: The high court of Rajasthan has released employment notification regarding 48 District Judge Openings. Candidates who find themselves eligible for Rajasthan High Court Recruitment must fill the online application form before the closing date. The process to fill Rajasthan High Court application form will be commenced from 26-09-2018.So appliers are suggested to check the entire eligibility parameters before applying for Rajasthan High Court jobs. Those who are meeting the entire eligibility criteria must submit the application form on or before 10-10-2018. Candidates who wish to enhance themselves through Rajasthan government jobs are required to send the prescribed application form along with all documents/testimonials to the below postal address. The last date to send print out of application form (along with demand draft) by registered /speed posts is 25-10-2018 (Thursday). To gather detailed information about Rajasthan High Court Recruitment 2018, candidates are advised to go through the content of this page which is well tailored by our team of www.privatejobshub.in. Candidates must have possessed a Bachelor degree in Laws from any recognized University having seven years of relevant experience. The minimum age for District Judge jobs should not be less than 35 years and the maximum age should not exceed 45 years as on the date of submission of application form. 5 Years of age relaxation shall be provided to Scheduled Castes, Schedule Classes and Women Candidates. Candidates are going to be shortlisted on the basis of direct recruitment which includes written test consisting of paper-I (100 marks), paper-II (100 marks) and language test (50 marks). Those who qualify in written test will be called for personal interview round so to test the general knowledge of candidates and his fitness in order to get selected for District Judge jobs. Shortlisted candidates will be offered starting pay scale amounting to Rs.51550-1230-58930-1380-63070 as per Rajasthan government norms. To apply for Rajasthan High Court Recruitment, you need to visit the official website of organization that is hcraj.nic.in. On the homepage, candidates are required to select “Recruitment” tab present at the left side of page and again choose “Recruitment” link. 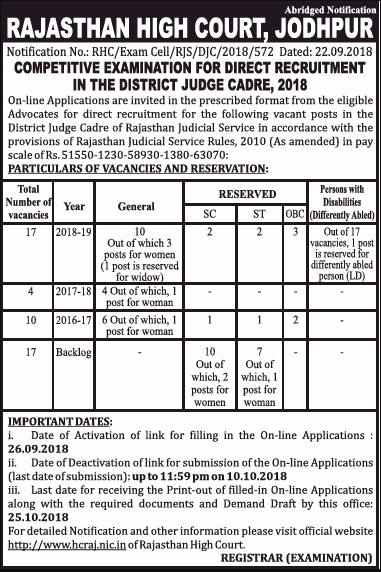 Now, hit on “District Judge Cadre 2018” to get complete notification for Rajasthan High Court Recruitment 2018. Candidates must have valid SSO credentials (ID and password) to apply for the post. If candidate does not have the same, he/she can register himself/ herself on sso.rajasthan.gov.in/sign in. After creating SSO ID, candidates can fill the online application form for Rajasthan High Court Jodhpur Recruitment with complete details in correct manner. Upload soft copies of documents, certificates, signature and photograph along with application form. Check dully filled online application form once again and press on “Submit” button. At last, take a printout of the application form and send it to the below postal address within the specified time.